Over the past several weeks, John Szymankiewicz has been writing an excellent series about how to design a mash tun. Week 1 was the material/container used for a mash tun, week 2 was all about how you drain your wort, and week 3 covered the different sparging techniques. In this last installment, John is going to talk about the methods to control your mash temperature. If you’re currently brewing all-grain or have looked into it, you know that the entire mashing process is about extracting fermentable sugars from your grain that you can them turn into wort. Anyway, the grain comes with starch rather than sugar inside the husk. Think about the difference between a potato (starchy) and an apple (sugary-starchy). But nature helps us out quite a bit on this one. It turns out that the grain comes prepackaged by Mother Nature with all the enzymes needed to turn that starch into yummy simple sugars. It’s like it was made for us to make beer! Oh, and it feeds the grain if were planted and tried to make a plant too, but we’re here to talk about beer. Enzymes are a little like keys crossed with cake – stay with me on this one: The key part “unlocks” the starch and lets it be converted to a sugar, a complex molecule (starch) moving to a less complex molecule (sugar) that the yeast can work with. Here’s the “cake” part: The enzymes need heat to work, but not too much heat. No heat – well, it’s just grain sitting in water, which will extract a little bit of sugar. Some heat (say, between 100°F to 135°F), now we’re getting those enzymes moving and working, sorta like the first warming of the cake in the oven, starting to get some crust on it, but still squishy inside. Just the right amount of heat (about 135°F-160°F) – those enzymes are happy and chugging along turning every bit of starch into sugar and they can keep it up all day long, like the nice warm cake right from the oven that you don’t even wait to cool before you grab a slice. And then there’s too much heat (over ~170°F) – We’ll jump straight to the cake part… when you overcook a cake you get a big charcoal briquette, the dogs don’t even want it at that point, same thing happens to the enzymes only it’s called denaturation. So, to make the most of your mash, you need to keep the enzymes happy with not too little, and not too much, heat. There are two main enzymes that do the bulk of the work in converting the starch: α-amylase and β-amylase. One likes it a little cooler (~140°F-155°F) and the other a little warmer (~150°F-160°F). So, if you’re really on the ball with your process control, you can even preferentially create one type of sugar over the other. Want mouthfeel without the alcohol – you want to aim more at the α-amylase sugars. Going for a BIG alcohol beer that’s really dry, maximize your fermentability with β-amylase sugars. Temperature control, and mashing generally, is all about getting what your want out of your mash so you can make the beer you want to make. Professional brewers often use a system of heat exchangers, jacketed vessels, and mash rakes to ensure constant and uniform temperature control in the mash tun. There are ways to scale this down to the homebrew level, but let’s start with the low cost, simple version. Well, it’s not as simple as that, but it’s close. See, whether it’s done in your brewing software or scratch pad calculation, you can figure out what temperature water (and how much) you need to add to a given amount of grain to get the temperature you want. If you get that calculation right (i.e. your Strike Water), you can nail your mash temperature from the moment you mash in (mix grain and water). Once you get the right mash temperature, cover the tun and, maybe, wrap it in a blanket – better yet, use a cooler for your mash tun. The mash should keep pretty decent temperature on its own. Once heated to the right temperature, even if you aren’t using a cooler for the tun, the grain slushee has a lot of thermal mass. You’ve created a slurry of close to 30-40lbs of hot, moist cereal, it’ll take a while for that to cool off substantially. Providing that you’re not removing the lid a lot (heat rises, ya know), and the tun is out of the wind/weather. My guess/experience is that even with no temperature control, you may only lose 2-5°F over the hour to hour-and-a-half you might be mashing (and that’s a pretty long mash – I’ve heard stories of even processional brewers mashing for only 30-45 minutes!). So, it’s not great temperature control, but it is cheap and it is simple. Do some experiments and figure out what your temperature loss is like. And remember, it may vary with the time of year, etc. Ok, the next logical step goes like this: “if I want to control the temperature more than just wait and see, I’ll just heat up the mash!” Unless your mash tun is creating cold fusion in your garage, the only temperature change you need to worry about is heat loss (the mash temperature going down). So, you might think that it’s a simple matter to put your mash in a kettle and gently heat it on the bottom to balance the heat you’re losing during mashing. It sounds simple, but I’ve made my share of burnt-carmel helles and I wouldn’t recommend it. The set up (described above) is simple, and relatively cheap. All you need is a burner and a pot big enough for your mash. But, it’s not as easy to control as you might think. Like I said above, let’s assume your losing, say 5°F, no wait let’s double it and say you’re losing 10°F over the course of the mash. That’s enough temperature fluctuation that you’ll definitely be running into a different amylase enzyme. Now, you’re going to replace that heat with 400, 500, or even 600°F flame at the bottom. Oh, and you’re mash is close to the consistency of oatmeal, so it doesn’t move around much. In all likelihood you have burned or charred the mash at the bottom of the kettle and the stuff at the top is still 5-10°F cooler than where you want it. Even if you’re stirring until your arms feel like wet noodles, you’re still putting in a lot of heat at a single point (the bottom) and it will be hard to control that. With all that heat and sugar in the mash (at the bottom at least), you start to get melanoidan formation and maillard reactions, leading to a butterscotch, toffee, or carmel note in the wort. Works great for a scotch ale, not so good for the helles I mentioned above. And you have to scrub like the dickens to get that stuff off the bottom of the tun later. 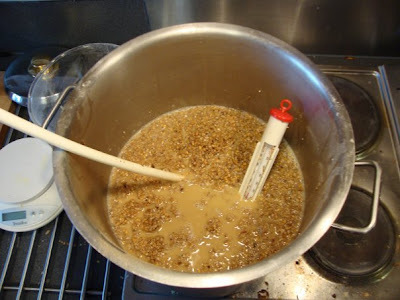 Decoction is where you take a portion of the mash, normally the thickest third of the mash, and bring it to a boil, then return it to the main mash. This is a very old method for adjusting mash temperature. Way back before we had reliable thermometers, it was hard to tell how much heat you were adding. But, brewer’s figured out that boiling is boiling and it’s pretty much always boiling temperature (I know, rocket science, huh?). But they went on to figure out that if we take so many pounds of boiling mash and add it to so many pounds of not-boiling mash, it gets warmer in predictable amounts. Doing this we could shift a mash 10, 20, 30°F or more without burning or ruining a portion of the mash. “But,” I hear you say, “doesn’t that dena-, deenati-, dine-. 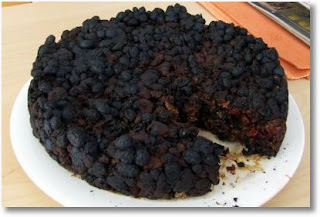 Doesn’t that turn enzymes into charcoal cake?” And the answer is yes, but only the portion that you took to boil. The remaining mash (generally 2/3rds) enzymes are healthy and happy and probably more than enough to do the work of their fallen comrades. Decocting your mash is cheap and simple (not as much of either as doing nothing, but still…), but it does have it’s drawbacks. First, boiling a thick slurry mash isn’t as easy as it sounds. You have to stir constantly over gentle heat. When I say constantly, I don’t mean stir – stop, take a sip of your beer, stir some more. I mean – stir, stir, and stir some more. Depending on the size of the batch and your temperature regimen, your arms will feel like jelly at the end of the day. If you don’t stir constantly, you run into the same burning/charring thing we talked about in the last section. Next, you have to heat it gently. Too much heat… burnt again. Last, it does take another pot, another burner, and some time that you could be doing something else while your enzymes are working (cleaning, weighing out hops, regailing your friends with the story of that time you made carmel helles…). RIMS, or Recirculating Infusion Mash System, is a method where you remove some of the mash, heat it, and re-introduce it to the main mash. Sound familiar? Sure. It’s decoction mashing in a different sweater. The difference is that this is done continuously. In most RIM systems, you draw off some of the mash liquor while you’re mashing, run that through a heat exchanger or a heat stick, then return it to the main mash. A couple of things are needed here: with all that moving of mash liquor, you probably need a pump, and not just any pump. You need a pump rated at the temperatures you’re going to be using and it has to be rated for food service (no extra points at a competitions if your “chewy” stout gets it’s special character from the rubber gaskets in the pump). Next, you’re going to need a way to add heat to the liquor. Most RIMS I’ve seen use an externally mounted heat stick (basically a water heater element hooked up to your power supply) that’s enclosed to heat the liquid that passes over it. So now we’ve introduced a couple of factors into the equation: Electricity and Power Equipment. I’ve touched on the pump already. The ubiquitous March pump is the go-to pump for homebrewers (I have two and love them). The heat stick you can either buy or make yourself. If you build it yourself, just be sure that it is sealed really well, liquid and electricity don’t go particularly well together. For both of these, make sure that they’re plugged into a GFCI (Ground Fault Circuit Interruptor) socket, so that you don’t burn up your home if the water splashes a little bit and does contact the electrical wires. RIMS also allows the ultimate in convenience and control, because you’re adding heat in a specific amount to a specific flow rate at a specific location, you can add a real live temperature controller to monitor the mash temp for you. You simply set the temperature you want, make sure the pump is running and liquor is flowing over the heat stick, and let the controller decide when the heat stick needs to be turned on to maintain or increase temperature. These systems work really well, but now we’re talking more serious money. The pump, heat stick, and controller will run you $300+ for good quality parts. I ended up using a RIMS system as my everyday brewhouse, but not before I tried a HERMS (Heat Exchanger Recirculating Mash System). It uses the same idea as the RIMS, where I externally heat the mash liquor and return it to the mash to control temperature. But, HERMS differs because instead of a heat stick or other electrical device, HERMS uses a heat exchanger (fancy word for a copper coil) in another medium. It goes like this: the mash liquor comes out of the mash tun, through a pump and through the inside of copper coil which is (probably) located in the hot liquor tank and then back into the top of the mash tun again. Once again, you can also use a temperature controller to control the pump to maintain or increase the temperature of the mash. There are a couple of advantages to a HERMS system. First, it just uses a pump, so there’s fewer moving parts and electrical thingees to control. Second, it heats the liquor much more gently than a direct heating element. There are some that believe that you will get some carmelization on the heating element in a RIMS system. I’ve never found that to be true, but HERMS is a way to definitely eliminate the risk. As you might expect, there are some drawbacks as well. First, more equipment – now in addition to the pump and controller, you also need a copper coil or heat exchanger instead of a heat stick. Copper has gotten expensive and this can run you close to $100 by itself. Second, the speed with which you can adjust the temperature of your mash depends on how much liquid you can heat and how hot you can get it. With HERMS, the hottest you can get the liquor returning to your tun is close to the temperature of the hot liquor tank (or whatever source you’re using to heat the heat exchanger). So, for example, let’s say your mash is at 154°F and you want to raise it to 170°F. If you’re hot liquor tank is at 168°F, you will never get your mash temp up to 170°F. The most you can get it to is 167°F or maybe 168°F if it’s really well insulated and you’re not losing heat anywhere else. Also, the amount of heat that the liquor picks up in the heat exchanger is proportional to the temperature difference between the “heater” and the “heatee”. Let’s continue the example, if your hot liquor tank is at 168°F, the mash might pick up enough heat to raise the temperature a few degrees, say from 154°F to 160°F in the heat exchanger, but you’re adding that 160°F mash to a much bigger pool of 154°F mash, so it may only raise a degree or so. The next time through, the mash may get up only to 164°F in the heat exchanger, this time climbing 4°F instead of 6°F, the next time it may only climb 1 or 2°F. It gets harder and harder and takes longer and longer as to get the increased temperature as you approach the temperature of the hot liquor tank. I hope that’s clear. It’s sometimes hard to grasp intuitively without a couple years of engineering school – but I hear that warps your brain in other ways too. One other thing to think about, and maybe it’s just my experience, but the March pump I had a the time really struggled to pump through the coil/heat exchanger. The March pump is designed to deliver a maximum “head” (or height of liquid at discharge) of about 10 feet (somebody correct me if I’m wrong on this). Well, I think my coil was about 5-6 feet above my pump, then it had to push through the coil (there are friction losses there too), then back up and out of the hot liquor tank and into the mash tun. I was never really happy with the performance. But, as I said earlier, I know folks who have them and love them. In fact, the estimable MoreBeer’s 1550 brew sculpture comes with a HERMS system standard. Well, I let the cat out of the bag early again, letting you know that I have a RIMS system. I really like it; it’s flexible, easy to work with, reliable, and I can do step mashes with the push of a button. But, it’s not for everyone. I worked with the “Do Nothing” method for close to 4 years before I moved up to a recirculating system. In fact, I actually started with Do Nothing, went to a direct fired tun and went back to Do Nothing when I got tired of all my beers tasting like toffee and being darker than I wanted. With any of the methods above, you can make world class beers. You may even change how you work with your tun for a specific style. Michael “Mufasa” Ferguson of BJ’s is adamant that the right character for rich, malty German style lagers can only be achieved through decoction. Whereas others, like Mr. Malty – Jamil Zainesheff of Heretic Brewing, have said that while there may be a slight difference, it may not be worth the added effort for the miniscule return of decoction. Each of the methods above have their advocates and detractors, you need to find what works for you, your process, and your budget.